Those darned corneal erosions that won’t heal! I frequently get asked “what is the most common problem you see?”. The long answer is “depends!” as different species get different diseases, different breeds get different problems, and some problems are seasonal and others are year round. So the allergic conjunctivitis may be absent in winter but cataracts occur at any time and at any age. 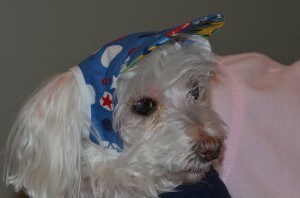 But one of the problems that shows up on our doorstep on a regular basis is the non-healing corneal erosion in the dog. Your poor friend may be squinting and pawing for weeks in spite of repeated attempts to heal with various topical medications that don’t quite get it done. Well have no fear, we have lots of information and numerous options to get these frustrating lesions to heal. First things first! The cornea is the clear windshield on the surface of the eye. Its clarity is maintained by a good amount of tears and, in mammals at least, the lids to protect it. It has a ton of nerve endings associated with it to alert us to the smallest particle or irritant so that healing can proceed at a rapid rate. And to maintain its function as the windshield of the eye, healing is optimal if the clarity is minimally affected at its conclusion. Cross section of the human eye. The cornea is on the left. 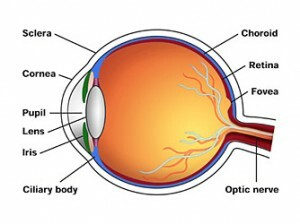 This structure is a common location of concern for us since it is a frequently damaged or diseased layer with obvious importance to vision and comfort. In a geeky ophthalmologist way, this is my favorite tissue to assess and treat. And thankfully, there are a limited number of opacities that we can see on the cornea that relate to its diseased state. These opacities are grouped into a common lecture I give general practitioners to aid them in diagnosis. But I digress…it is the superficial corneal erosion that is our topic today. Ulcers or erosions of the cornea come in different flavors, some superficial, some deep. Some are infected, others are not. Some are traumatic, many are not. However, a feature of healing of the superficial layer is the same. The surface tissue of these defects heal from side-to-side in a sliding and sticking process. And that process should occur in a few days in the proper environment. It is the inability of this sliding and sticking mechanism to work that is the root of the evil in many of these specific non-healing erosions. There are many names for this entity. The Boxer was and is a common breed to experience these and thus were call Boxer Ulcers in the past. Other names include non-healing ulcers, indolent erosions and recurrent erosions. Recent nomenclature has gotten fancy calling this SCCEDS for spontaneous, chronic corneal epithelial defect syndrome. I prefer indolent erosions which will be used as we go on. Indolent erosion. Notice the loose edges that are peeling back. The three features of indolent erosions are as follows. First, they usually have to be present for up to 3 weeks in the first instance to determine it is an indolent. Secondly, no infection is present. Thirdly, only the superficial or epithelial layer is involved and is characterized by loose edges that easily debride or fall off when gently rubbed with a cotton-tipped applicator after placement of a topical anesthetic. A trauma is rarely seen and thus most are considered to be spontaneous rather than a traumatic lesion that does not heal. However, some clients do observe some initial event. Now one thing to be clear! Not all ulcers or erosions with slow healing fit into this class of disease. Abnormal hairs directed on the cornea, ulcers that are deep due to the presence of bacteria or degenerative lesions from mineral in the cornea may be examples of problems that will progress in a similar but different manor. So before you tell your veterinarian to do A, B, or C, make sure the appropriate diagnosis is made! So you have been treating Rex for 3 weeks with 4 different antibiotics, artificial tears, serum, clizabethan collar, Uncle Jimmy’s special blend, tea bags or whatever and still have not seen a complete resolution. Never fear, here is the mantra. This type of superficial erosion with loose edges +/- blood vessel response will always heal, rarely become infected and rarely get deep. So you can treat them until you are blue in the face with antibiotic and they won’t go away. The key is that we must mechanically address this inability of the surface tissue to slide and stick to effect a cure and there are multiple ways to achieve this. The most common procedures you will see us do for this disease is a punctate, grid or burr keratotomy. In general, this is what happens. After placement of a topical anesthetic, the surface tissue is debrided with the cotton-tipped applicator until all non-adherent tissue comes off. This could be the entire cornea or just a local region. This is the first step to healing and a small percentage of dogs will heal with this process alone. Your veterinarian may be comfortable doing this or has already done it. (Again, not every ulcer should be debrided, especially if it is not just superficial!). Once that is done, the base tissue called the stroma is roughened up using a needle to poke small shallow holes or grid lines or a fancy tool called a corneal burr that spins to alter this base tissue. My analogy is like priming a wall before you paint it. This prepares this tissue for the new cells to now slide across and adhere in a normal fashion. Healing will occur within a 2 week period probably greater than 80% of time. In our hands, this can typically be done without anesthesia unless your dog won’t sit still or the erosion is in a location that is difficult to access. Comfort is the key and if your dog seems 100% pain free at the recheck, it is more than likely healed. If they are better but not complete, you may be in the 20% and need more time, repeat keratotomy or additional manipulations that can be used to make these heal. 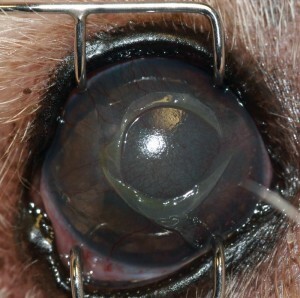 Contact lenses and corneal glue are other treatments that can be employed. If the lesion is big, been there forever and you just want it to be gone, a surgery under general anesthesia call a keratectomy, where the abnormal surface is shaved off, will heal these 99.9% of the time. But if we can manage these without needing an anesthetic event, we usually try that first. There’s lot more we could talk about with this common disease but can get even more esoteric than what I have already written. But if this sounds like your dog, there is a good chance that we can help you out! By the way, cats don’t get this disease and non-healing erosions would be treated differently….so much to learn! Stay warm!